After marching through a dark and abandoned warehouse where the laws of our reality don't seem to apply, agents Shaw and McGregor have come out the other side into something even stranger. They've come face to face with the deranged serial killer that started them on this hunt and he's just as creepy as ever. Meanwhile, their boss, Driscoll has entered the warehouse in search of her lost agents and she's about to witness the horrors of this place firsthand. A Walk Through Hell excels in its unmistakable feeling of dread. It is a constant stream throughout every single panel. Even when we're seeing a flashback or when Driscoll is pulling us through her history with some of these characters, you're always waiting for the other shoe to drop. 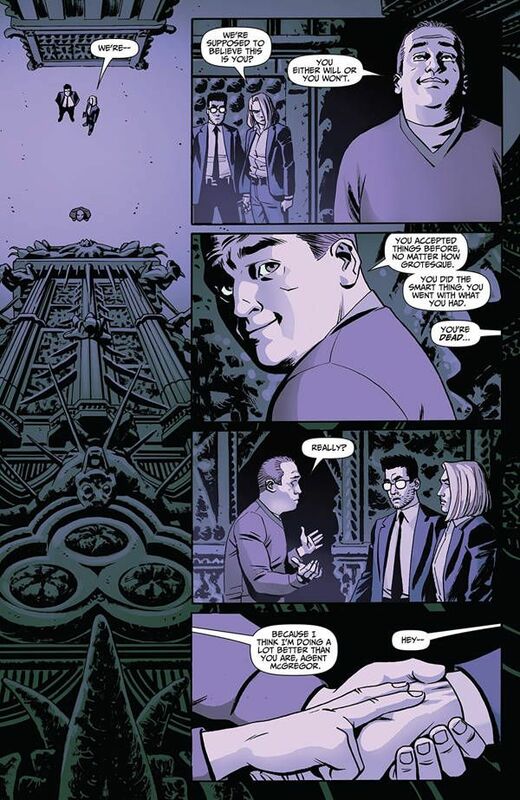 This allows writer Garth Ennis to weave in some additional points. Taken on their own, they might come across as a little preachy, but they flow well here, further developing the characters and their relationships with one another. 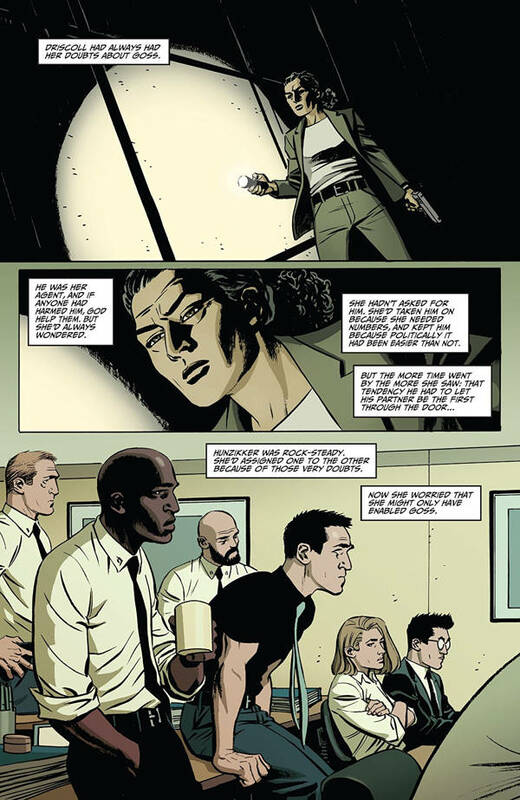 This issue features a spirited debate about identity politics during a flashback of Shaw and McGregor on a stake out. Ennis expertly takes us through this, giving us an “a-ha” moment that resonates beyond this comic, while building the overall narrative. Much of A Walk Through Hell is dialogue-driven, not unlike a film by Quentin Tarantino or Aaron Sorkin. The characters are constantly sharing stories or having this deep, internal narration. Even with all this exposition, we're always plugged in every step of the way. Letterer Rob Steen walks us through all this text. It can be a lot to take in, yet it's never overwhelming. The word balloons almost create this false sense of security. If you were to look at them on their own, they wouldn't be all that scary, however in the context of the book as a whole, it's terrifying. We know that these characters could encounter almost anything with the next turn of the page. 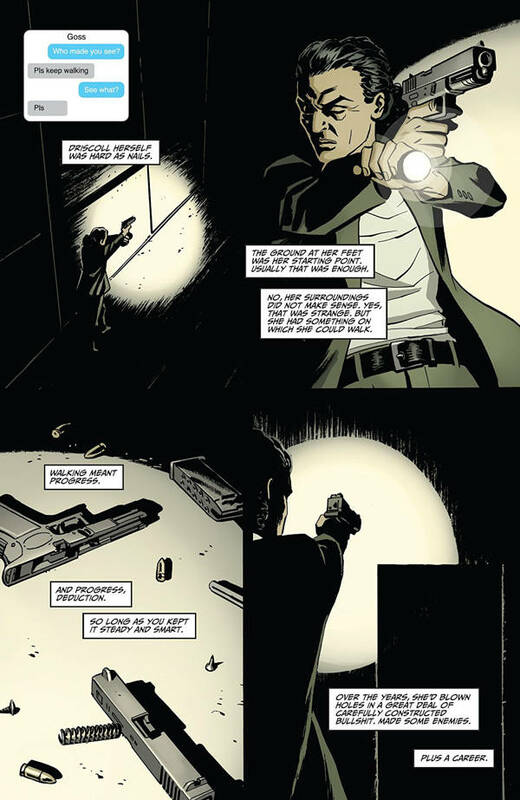 Colorist Ive Svorcina sets the tone for each scene, particularly the confrontation between the agents and the killer. These segments are shown in a purplish hue, adding to the unnatural mood of this encounter. These contrast well with the gritty nature of the other sections of the warehouse, not to mention the blood. Yes, there is blood. A Walk Through Hell #7 builds up to one of the most unsettling and gruesome sequences in recent memory. You have some idea of what might be coming, but you don't know for sure until you turn the page and see it in all its gory detail. Artist Goran Sudzuka grosses me out in just a handful of panels. My eyes were wide as I studied these images, unsure of what I was seeing at first. My stomach churned as I realized what I was seeing. This segment works so well because of the build up we've had up until this point. This is the equivalent of a thousand jump scares. You can cut the tension in A Walk Through Hell with a knife. It's this white-knuckled ride where you just know something horrible is waiting for you around every corner, but you have to keep going. Curiosity is pushing you forward, even if that means certain death. That is such a great feeling for a horror comic.